Clear Water Pools, owned by Mark and Tammy Fell and located at 1046E. 10th Street in Roanoke Rapids, has been making the Roanoke Valley a rockin’ place to swim, dive, splash, and play for 15 years. Clear Water Pools offers everything you need to enjoy your pool from start to finish, including both above-ground pool installation, pool maintenance with supplies including chemicals, pool service including both above-ground and in-ground pool liner replacement, and even pool accessories. Tammy Fell says that if Clear Water Pools doesn’t have it, their staff will find it and order it for you. 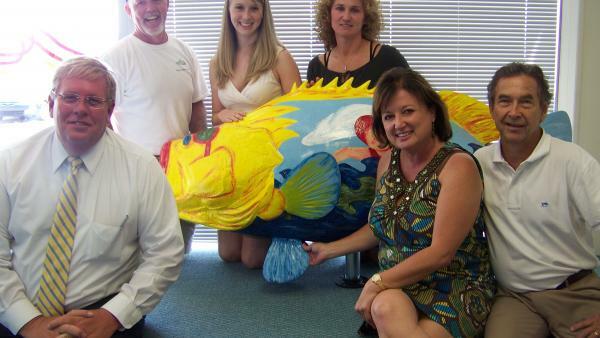 Clear Water Pool’s rockfish, displayed prominently in their store windows, was designed and painted by artist Jane Deese and features sun, waves, sunglasses, swimmers and more! Clear Water Pools is proud to release their fish to the Roanoke Valley. There to celebrate with them were (l-r) Allen Purser, President of the Roanoke Valley Chamber of Commerce; Clear Water Pools staff including owner Mark Fell, summer assistant Brooke Johnson, and owner Tammy Fell (not pictured office manager Phyllis Davis); Sherry Wade, President of Halifax County Arts Council; and Gene Minton, Chairman of the Halifax County Convention and Visitors Bureau.